« Day 459 In Istanbul: Dog Days Of Summer. Day 460 In Beijing: Yenikoy. Jill’s friend, Kaan, lives in Yenikoy. 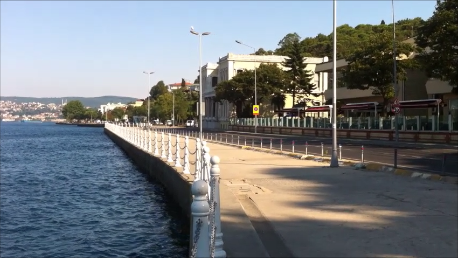 It is just north of the 2nd bridge and a world away from the hustle and bustle of downtown Istanbul. We walked around, checked out the views and the dogs, and just took our time since Kaan wouldn’t be home for an hour or two. It was so peaceful and so relaxing that we didn’t want to leave. We stopped by the little market and bought a few beers and just sat down and had a break. There were a few older men sitting by us and they were doing the same thing. Since Turkey is a Muslim country, drinking is somewhat looked down upon. However, we saw loads of people drinking and doing whatever they wanted so we weren’t really worried. That being said, we made sure to keep our beer in a bag and put it under the bench we were sitting on, so as not to attract any attention. Yenikoy really reminded me of Marin and Sonoma County and both Jill and I felt a little bit homesick. We were able to get over it, pretty quickly, since we were having so much fun and enjoying seeing this beautiful bit of Istanbul.